We use only the finest bone china porcelain from England because it is simply the best and most durable ceramic clay available. We use it exclusively in our products because the pottery you purchase for your church should last for many years. Porcelain is fired to a much higher temperature than earthenware, and is much more durable and resistant to chipping, cracking or breakage. 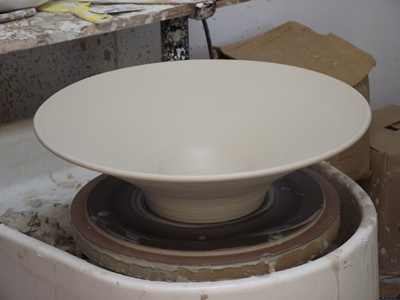 You will commonly find ceramics manufactured for churches is made with "cost-effective" materials. Some companies use a porcelain slip applied over earthenware. This gives the appearance of a superior product. It is not. Earthenware is a low-fired clay, the same material used to make ordinary flower pots. It is easily chipped and broken, and will not withstand normal handling and washing over time. There is a substantial difference in quality and durability between wheel thrown pottery and ceramics that are made by pouring liquid clay into molds, so we urge you to choose your church ceramics carefully.